Tellink’s Comtel-GPRSNet is a powerful multi-port (RS-232, RS-485, Ethernet and GPRS) communications hub. This piece of equipment has been specifically designed to provide mobile high-performance connectivity over GSM/GPRS or Ethernet networks within those situations where there are several M2M devices operating simultaneously and where these devices may have different communication interfaces. Additionally, ComTel-GPRSNet has the ability to interface with external devices (alarms, remote control systems) through an optional I/O module. Typical Comtel-GPRSNet M2M applications are smart metering where multiple devices require simultaneous metering, Security/Surveillance, industrial or commercial remote control systems, among others. But in fact the number of applications is almost unlimited given the multiple communication interfaces and communications networks on which it can operate. Also it is an ideal solution to be integrated in SCADA (Supervisory Control and Data Acquisition) systems. All Comtel-GPRSNet parameters can be set either locally via the serial port, or remotely, and it allows remote firmware update when needed. Due to its robust design and multiplicity of applications, it is ideal for use in industrial and commercial environments. 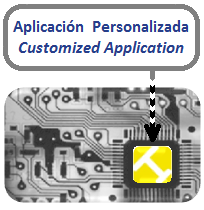 Additionally, as all other members of this product family, it is ready to include Tellink’s embedded customized applications (e.g. PLC’s, remote control of industrial devices, etc.) making ComTel-GPRSNet into a powerful M2M communication tool which can be adapted to any complex application.